A new class of napkin has just hit the market. 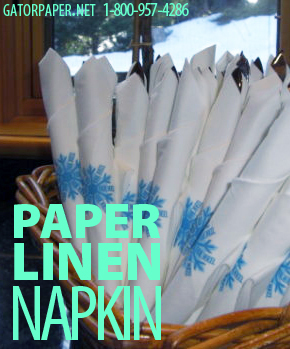 Custom Printed Paper Linen Napkins are a more formal style to the classic paper napkin. This style of napkin is perfect for your next formal dinner, fund raising event or upscale restaurant. The quality napkin provided by Gator Paper is the perfect choice to fit any size function. The Custom printed paper linen napkin comes in two sizes and is only available in white, however Gator Paper does offer other napkin styles to fit your needs. This napkin is uniquely made with a thick linen like texture putting it in a new class of superior napkins. This napkin is uniquely made with a thick linen like texture. Our custom printed paper linen napkin can also be designed with your brand logo printed in full color on the napkins. Whether you have a large fine dining establishment, a small upscale cuisine bistro or want something new to add class to your franchise restaurant, we can make your logo look exactly the way you envision. A great way to market your brand with customers! Check out the Gator Paper website for further information on this product and the other great products Gator Paper offers. Gator Paper supplies everything from French fry scoop cups, cushion foil hot paper, butcher paper, clear plastic cups, beverage napkins, handled bags, and more. Whatever your business may need, we have a wide variety of food packaging products to make your business stand apart from all the rest.